This one is short(er) too... I am on a ROLL! I mentioned in an earlier post that we had an AWESOME supper not too long ago. I also mentioned (here) that I love to read cookbooks more than I love to read novels. And I love novels. Well, I bought 3 cookbooks when I went to Barnes and Nobel last week: Pillsbury, Hersheys, and best of all, Campbells. Holy smoke stack, folks... I am like a kid in a candy store except for the fact that I am not a kid (physically) and it is not candy that I love. Well while reading my book with post-it notes in hand, I marked down a couple of pages that I have to try. Ready? Sure you are: Skillet Chicken Parmesan. Now, I will warn you, this is a recipe that almost requires you to improvise. I am estimating with the cheeses, amount of chicken, etc... use what you need. Stir about half of the Parmesan cheese into pasta sauce and set aside. Add olive oil to skillet and heat 1 min. Add chicken and cook until browned. Drain. While this is cooking, be sure to throw your pasta in a kettle of boiling water. It will take about 15 minutes. Also, be sure to add olive oil to the cooking noodles so they don't stick together! 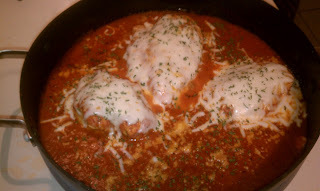 Pour pasta sauce/Parmesan mixture over chicken; turn breasts over to coat both sides with sauce. Cover and cook over medium heat 10 min. or until the chicken done. Top with mozzarella cheese and remaining 2 tbsp. Parmesan cheese. Let stand 5 min. or until cheese is melted. I also threw on a little parsley and a pinch of garlic. Yummy! Place the chicken and some extra sauce on top of the pasta and serve. 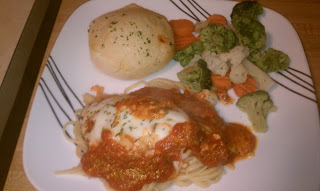 This meal goes great with garlic bread and steamed veggies. This one is D-E-L-I-C-I-O-U-S! Even the leftovers are wonderful! Be sure to let me know if you tried it and what customizations you made so I can try it your way too! Join in for Food Friday!